Girls Who Code is a program for girls who are interested in learning about computer science and how to impact their community. This program exposes girls to positive female role models with a background in computer science. For more information, please contact the Office of Pre-collegiate Outreach Programs by email at pop@wpi.edu or by phone at 508-831-4900. 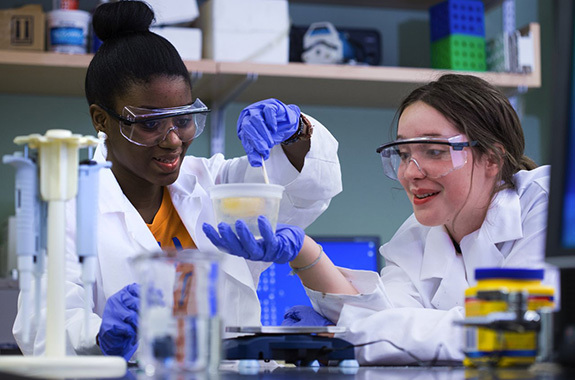 Middle school STEM Experience offer opportunities for younger students to visit WPI and discover science and engineering with some of our top undergraduate students. For more information, please contact the Office of Pre-collegiate Outreach Programs by email at pop@wpi.edu or by phone at 508-831-4900. SPLISH is a fun, hands-on learning program for children in grades 5-8, featuring workshops presented by Massachusetts Academy of Math and Science students under the guidance of Mass Academy faculty. This is a half day program which runs during April school vacation. For more information, please contact Mass Academy by email at mams@wpi.edu or by phone at 508-831-5859. Is your student interested in science? Do they love math? Do they want to build a skyscraper or participate in a lab dissection? If they answer yes to any of these questions, or has a general interest in the STEM (Science, Technology, Engineering, and Mathematics) fields, then Tech Kids is an excellent after-school program for them! Tech Kids is a WPI outreach program that encourages students to pursue study and a career in the STEM fields by exposing them to many different fields of science and engineering along with a wealth of positive role models. During each session, WPI students facilitate a wide variety of hands-on activities that promote creativity, problem solving, and teamwork in middle school students. For more information, please contact the Office of Pre-collegiate Outreach Programs by email at pop@wpi.edu or by phone at 508-831-4900. *Notes: There are no parent opening or closing sessions. If WPI or Worcester Public Schools are canceled due to inclement weather, this program will also be canceled. A snack will be provided for each student, but if you choose to bring your own, it must be nut free.